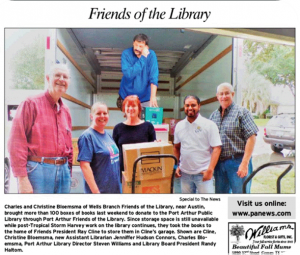 The Friends of the Wells Branch Community Library helped the Port Arthur (TX) Public Library rebuild its collection after a total loss due to Hurricane Harvey. We collected a storage locker full of books and materials and delivered them to the Port Arthur FOL. Thank you, Wells Branch for your support, we couldn’t have done it without you!